Chicago, IL: Recently my daughter-in-law and I were lamenting the fact that "our" Starbucks closed. It was the one we both seemed to stop at when out-and-about…not that there aren't at least four others equidistant from my place. The good news is it didn't close. It only moved two blocks north. The better news is it serves wine in the evening! A quick sketch while waiting for my brother. Color added later. Elmhurst, IL: I have met very few people in my lifetime who get excited about the dreaded railroad crossing. In fact the news would confirm that more and more people believe they can outsmart the crossing gates and have had to pay dearly for that error in judgement. I am rather the opposite where I look forward to the latest artwork on the train cars, rendered by the unknown graffiti artists scurrying about the railroad yards at night, and on display for the general public imprisoned at the crossing gates. I find this art rather compelling and the one element that makes waiting for a freight train more enjoyable. Consider, then, that the art of Urban Sketching exercises the artist's observation skills of the world right before them, and now the mundane and overlooked become the hero of their compositions. I had such a moment recently when I was stopped by the activated crossing gates and was overcome by the complexity of signage and warnings that have become necessary. "Do not stop on Tracks," "Caution: walk time shortened when train approaches," and "Warning: Fast moving trains." The only one missing might be "Warning: crossing the tracks while gates are down may kill you." Regardless, it is this kind of over-communicating that becomes great subject matter for the Urban Sketcher. The more curious, the more there is a backstory attached to the sketch, the better. Sketch: Prismacolor 005 Premier Pen and Prismacolor color markers on kraft paper. I really enjoyed the day. I love sketching with markers! I used Copic markers on Render marker paper. Urban Sketchers-Chicago met at the Garfield Park Conservatory yesterday. We had a good turn out – more than fourteen of us! I haven't been there since the Chihuly exhibit ten years ago! 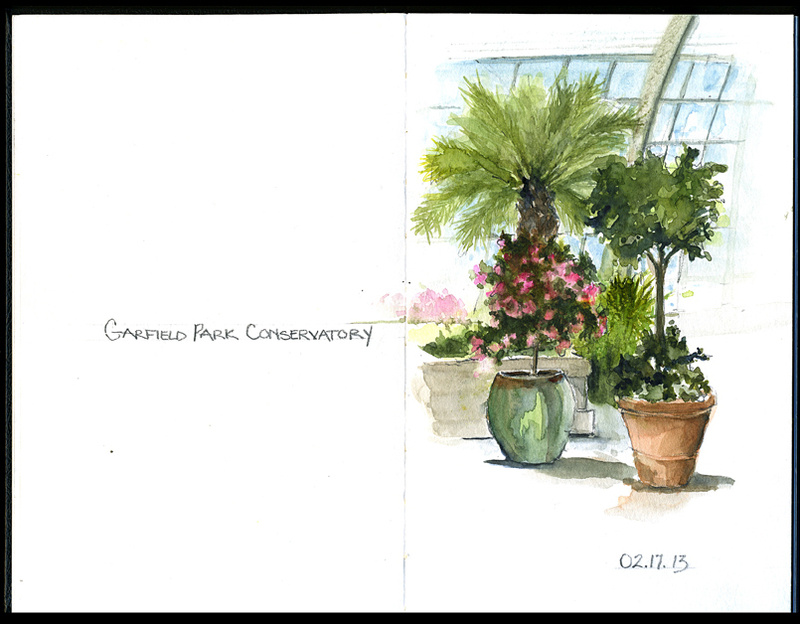 In the gray Chicago winter, enthusiastic sketchers, sun and color made for a great day! It's a great group – all ages and levels of experience. 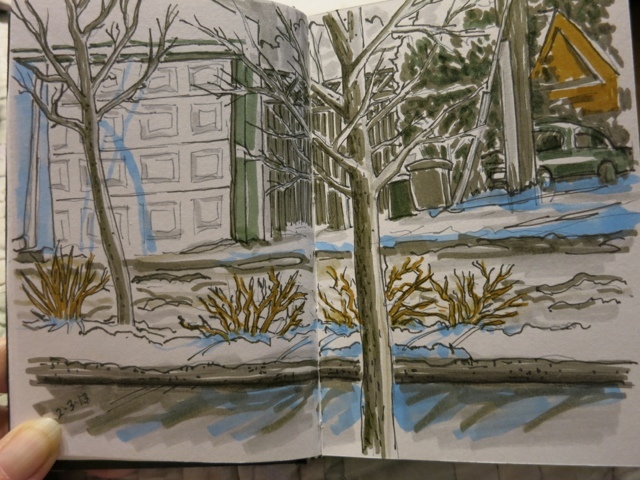 I was using the Stillman & Birn Beta series sketchbook - just love it! Sketching can be therapeutic. Losing a pet can certainly be a major bummer but I discovered that being able to sketch out my thoughts and feelings has helped me work through the sadness and move me towards healing and celebration of my life with my first dog. This is a sketch I did of my first dog, Tucker, a Jack Russell Terrier, who impressed me as a very smart breed of canine who exhibited some very human personality traits. After 13 years, we had to put Tucker down this past summer due to his age and health complications. While it's nothing new to have a pet owner go on and on about how great their pet is or was, I am suggesting that if you are sad or hurting or need to think things through, turn to your pencil, marker, paint brush and just start moving it around. At first, everything you draw will be garbage. That's ok because your mind is filled with confusion and garbage too. But in the same way that mixing paint can be a trial and error process, so too can sketching to work through life's difficult issues and the results can be marvelous. Sketching, for me, is one of my best friends. The view of the very north end of Lincoln Park is always changing. There is usually a steady stream of people - walking dogs, jogging, biking, sitting on benches. The lake beyond the park changes color and motion from minute to minute. But on this particular morning, no one was out and about - a random person would pass by every twenty minutes or so - and the lake was frozen stillness. The sky just melted into the lake, and there were no shadows. It was beautiful and peaceful, and I wanted to capture that feeling on paper, but I wasn't sure how to begin. Ultimately, I decided to try the pan pastels that I had recently purchased. Sometimes, I think it helps to not know what you are doing! I just had fun with the pastels, on tinted blue pastel paper. I added in trees (not all of them - there are hundreds!) with a dark brown Micron pen. When I was finished, I sprayed the image with a fixative. Some time in the near future, I would like to sit closer to my window and do another piece from a different vantage point, adding in the highway below for a more urban feel. Western Suburbs, Chicago: So there I was, on the commuter train towards my destination of work in the city. The typical train only measures about 10 feet from side to side and within such a short distance there were 8 humans--strangers--each doing our own thing. Some choose to sleep, many are on their cell phones or laptops and others rustle their newspaper. And then I was there with my sketchbook trying to capture it all. I have done several depictions of people on the train, looking for the subtle differences inherent in each life form. For this sketch I roughed out everything with pencil, then traced over the pencil with Uniball Vision Micro. Once back at my studio, I scanned this sketch and colorized it in Photoshop (which I might add still takes an artistic eye and hand skills). For me, Photoshop is just another set of tools that allows me to add color (without the clean up) and does not replace the ability to see and capture a moment in life.